Transform frustrating UTM builder, UTM code and link generation experiences into easy, error-free automated tracking link creation. The cool alternative to the manual, error-prone, & boring. Need to Build UTMs or Add Custom Tags? Single or Multiple Link Tagging? We've got it all. It's Easy-Peasy and Simple. Centralize, store & standardize link tagging. Visualize clicks and traffic. Track all banners or CTAs on your owned websites in seconds. Hootsuite bulk-schedule auto-tagging. 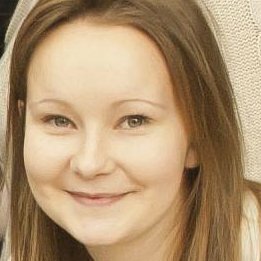 Single & multi-link UTM and custom tags. 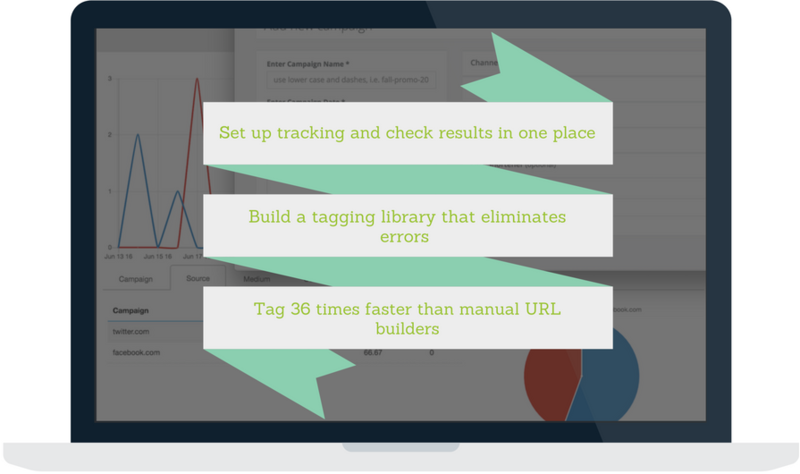 Add UTM code & custom analytics tags at the push of a button. Simple, no coding or manual work – for marketers by marketers. Plus free training. No typing, no mess. Grab any link on any page and save, save, save time. Invite your team or enjoy our individual plans. Automation in generating tags and building tracking URLs for reporting purposes is replacing the traditional manual campaign UTM code builders to save you time. You are also empowered to track consistently across your multi-channel and eliminate reporting errors with minimal effort. Faster user adoption rates due to our simple tracking link creation wizard and automation features including the web link auto-grabber or the UTM tag templates. Separating external & internal campaign creation & reports help segment marketing efforts and build analytics tracking URL best practices with a minimal learning curve. Integrations with Bitly, Short, Zapier, Google & Hootsuite enable multiple productivity features, incl. tagging and posting your Social schedule with a push of a button. Much More than a URL Builder. Making Things Simpler, Easier. After reviewing other tools in the market, I feel this one has a more user-friendly and easy to follow wizard-like UI, which makes the life of a marketer very easy. Best thing I like about CampaignTrackly is its ability to add and use custom channels, Geo parameters, and shorten the final URLs that even Google's URL builder doesn't do yet. Watch Our Easy-Peasy Tracking URL Building App in Action. See how you can track and report your marketing efforts without the need for manual work and time-consuming operations. Learn how you can add automatically all standard utm code parameters: campaign, source, medium, and content – without the need to program or write HTML. Tag 1, 10 or 100 links in seconds. Instantly add dozens of pre-set promotional channels to your marketing links instead of processing a link at a time with traditional URL builders. Let our code-free UTM + URL builder do the job for you. It will also shorten your links with Bitly. Get our auto-grabbing Chrome extension and capture the URL of any web page with a click. No typing. Just go to the page, right click and “grab”. 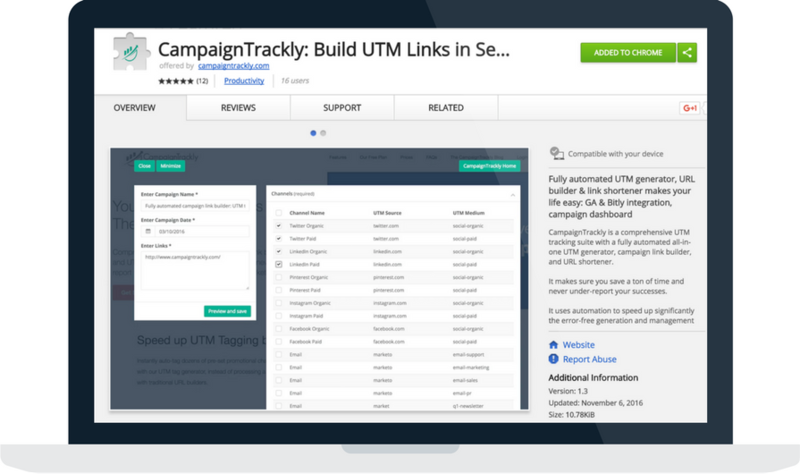 Both your UTM tracking parameters and links are saved in the CampaignTrackly website, so you can edit, re-use, or export them on demand. This is excellent. I love the integration with Google Analytics, and it makes it easy for someone not used to tracking since it walks you through the steps and does all the tagging for you. 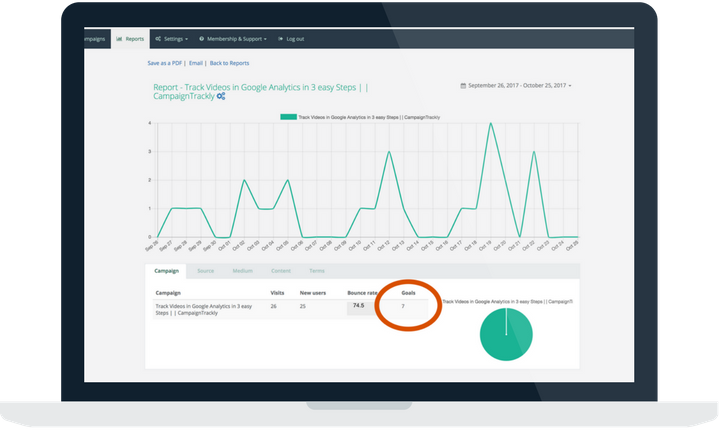 Pull Campaign Reports from Google Analytics with a Click of a Button. 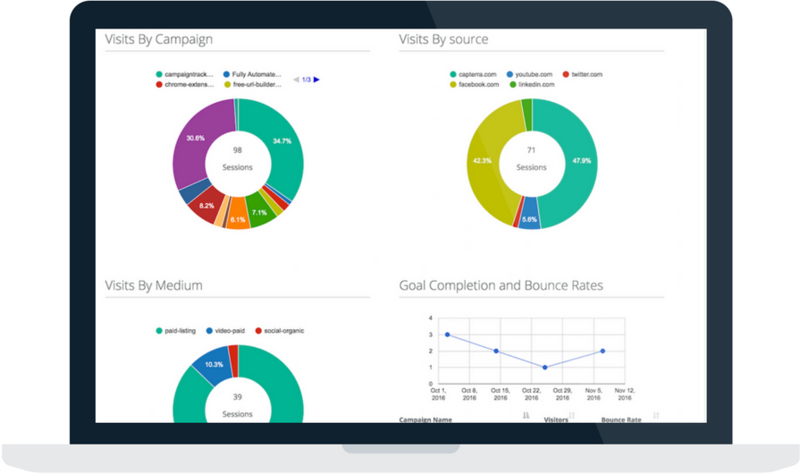 View the performance of all or each one of your marketing campaigns in our Reports page. Get the visibility you need to uncover under-performing links in seconds. Save time with our friendly, simple graphs that show easily accessible actionable insights. Increase the quality and accuracy of your campaign tracking & reporting data without the need to handle UTM code directly. Get instant visibility to all of your campaigns. Uncover and fix weak calls to action or assets that drive low traffic & conversions so you can get higher returns on your marketing investments. Over 30 tag conventions plus tagging templates to get you started fast. Standardize both regular and custom UTM tag use across your team. Remove the guesswork and eliminate typing and UTM errors. Use bulk-processing to scale up inbound link tracking & reporting. Give your campaigns a home for better transparency and accountability. Eliminate redundant back-and-forths between UTM tracking tools & spreadsheets. Out-phase manual work on long, error-prone tracking URLs. Save time to focus on more strategic tasks instead. Cut down on your UTM tagging time by 500%! 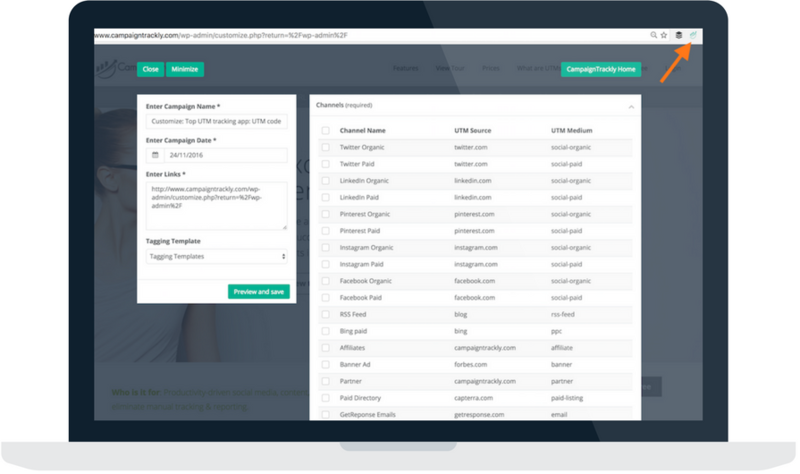 Add in seconds as many channels, content & term UTM parameters as you need. Use, re-use, or delete them in one click. Need to bulk-tag? Your wish is our command! Auto-connect with your Bit.Ly account in no time & get all your UTM links shortened automatically in one go as part of the URL building process. Need to bulk-shorten? You got it! No more manual workarounds needed! Auto-connect with Google Analytics – no code or tech. UTM tracking links are automatically saved in the reporting dashboard so you can see stats in nice & simple graphs. Campaign data is stored for as long as you need it. The insights that I gained through their graphs based on our Google Analytics data proved to be invaluable. I realized that only a specific target demo was responding well to my campaign, so we made sure to tighten our parameters. 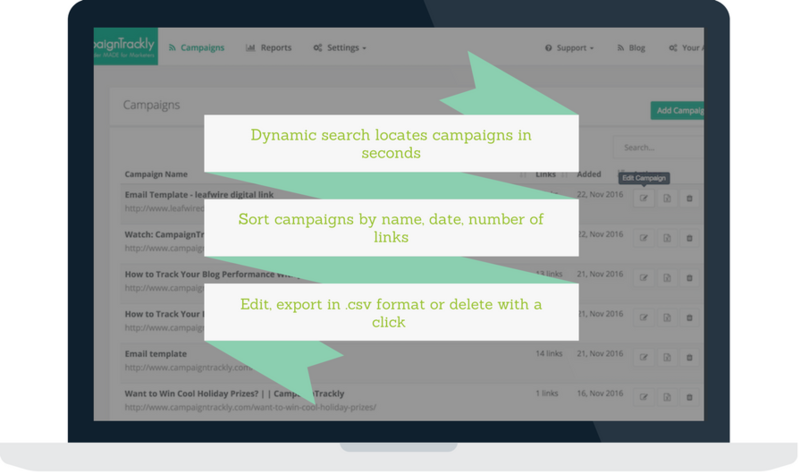 An additional benefit of CampaignTrackly was the hours that it saved both myself and my team in UTM tagging, which can be very tedious. I highly recommend this service! We wanted to find out which online marketing strategy was driving the most traffic to our website and this is where CampaignTrackly entered the fray. It automatically creates UTM parameters for our links, which has made it so much easier for us to track our campaigns.We have gained really useful insights from our analytics tool without having to spend any added time or resources. Highly recommended. UTM-based campaign tracking helps avoid under-reporting. It also delivers critical insights that enable you to optimize your marketing and drive faster growth. Unfortunately, the process of building UTM-tagged URLs is not always easy to implement due to the high degree of manual work involved. Luckily, with the degree of automation CampaignTrackly offers, getting performance insights is now easier and faster than ever. You can dramatically expedite tracking and win back time so you can focus on what you do best: creating more lead generation value for your company. 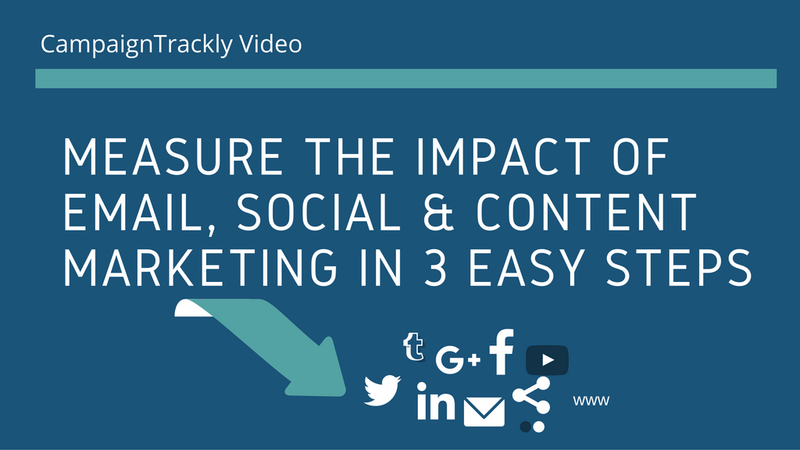 Measuring the campaign-level impact of your Social Media, Blog, Email, or any other channel shouldn’t be a hard and tedious process. CampaignTrackly empowers you to create, shorten & use your campaign tracking URLs in no time, so your day can be much brighter! It gives you the process & automation you need to win back valuable time and feel the joy of productivity while showing everyone you are doing such a great job.